You have an awesome business, manufacture best products or deliver an outstanding services to your customers in Toronto and area, but if you don’t explain what you do, how you do it or why your products or services rate better than your competitors, it may all come to naught. To gain the attention of the interested parties and your prospective clients, it is important to convey what your business is all about, and the best medium for this is the age-old printed brochures. It not only imparts information about your business, but also reflects your company brand. This brings us to the aspect of the importance of brochure printing. Whether your brochure is printed on a paper or being delivered online - it needs to convey the right image and message. For this, your brochure needs to be classy and include essential ingredients – graphics, text, paper, printing, etc. – of the topmost quality. Who would better than PrintSale.ca, one of the leading online brochure printing shops, to know about this? PrintSale.ca - brochure printing services. What does PrintSale.ca offers that other printing companies do not? For one, we serve multiple cities in Canada, including Toronto and area. Second, since we are the online printing company that means that you can access our website 24/7 and order your brochures as fast as 1-2-3. Third, we offer creative brochure design services on top of high quality printing! Being accessible online not only saves you time but also money once you place order through our system, as it is integrated with our production facilities for an optimized workflow. As a business, we fully understand the needs and requirements of businesses in the present-day competitive environment. We hold an exceptional expertise in professional brochure printing and endeavors to provide cheap brochure printing options to our customers across the country. PrintSale.ca – brochure printing Canada. We offer a variety of paper types, depending upon what is to be printed. You can find the available standard options for paper and cardstock you in the calculator on our website. The standard paper stock for brochures is 100 lb. Gloss Paper. 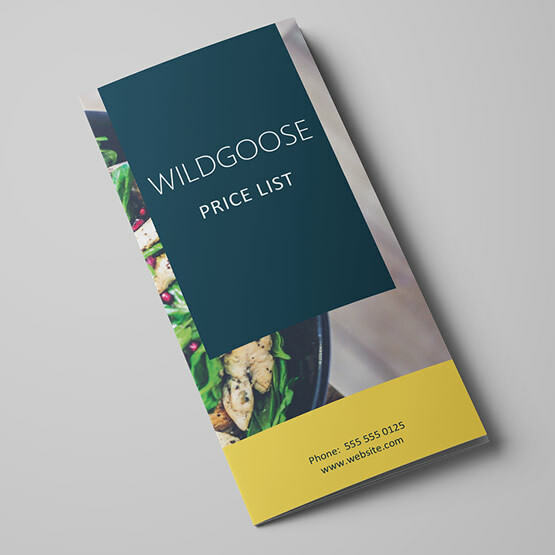 Should you require having your brochures printed on a custom paper stock, please do not hesitate to request a custom quote. As per finishing options for brochures, Gloss AQ coating is available for quantities 500 and above. That said, you can also have custom finishing options like Gloss UV coating, Gloss or Matte lamination and other cool options by requesting a custom estimate. Our standard brochure size is 8.5” x 11.0” inches flat, which you can order online. If you have a custom size in your mind, please request an estimate and our estimating department will put a custom quote for you. 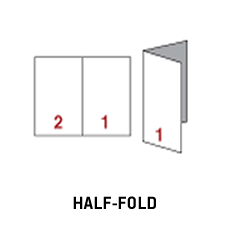 HALF-FOLD: This is a standard fold, also called book fold, that is obtained by folding the sheet of paper or cardstock once along the middle, creating two equal halves. Such a fold is ideal for takeout menus and handouts. This type of fold is available for online order. 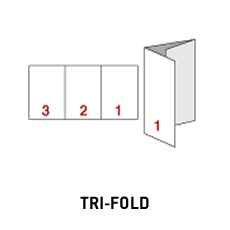 TRI-FOLD: In this, the sheet of paper or cardstock is folded into three sections along two parallel creases, dividing it into three sections. This kind of fold is best for brochures or for display boards and available for online ordering. 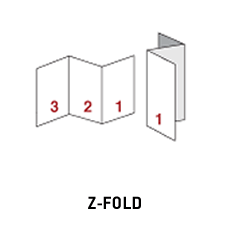 Z-FOLD: It involves use of two parallel folds to create six equal-sized panels – three panels on each side of the paper. Now with two additional folds made in the opposite directions, gives it the shape of the letter Z. This fold is mostly used for letters, flyers and brochures. This type of fold is available by custom quote. GATE FOLD: Gate fold is achieved by making one of the brochure pages oversized as compared to other pages. The extra portion is folded inside and can be opened out for reading. This fold is ideal for including drawings or layouts that are bigger in size than the standard page size. Available by custom quote only. 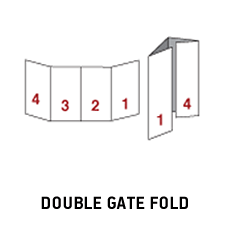 DOUBLE GATE FOLD: This fold differs from standard gate fold as it is made up of four panels. Two ends of a sheet are folded in the middle and the paper is folded again into half. This provides even a wider space for fitting drawings and layouts. Please request an estimate for this type of fold. 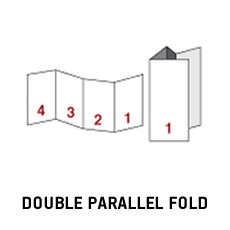 DOUBLE PARALLEL FOLD: Also called “parallel center fold” it is constructed by folding a sheet of paper in half and then again further folding it in half. This fold is most suited for mailers and customer reports and available by custom quote only. 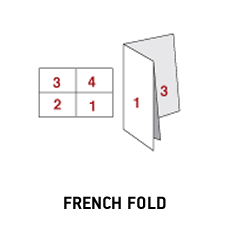 FRENCH FOLD: French fold (also known as “Half-fold then Half-fold”) involves folding the sheet of paper first vertically and then horizontally. After folding, it becomes the size of a brochure, but when it is opened it expands like a poster. This enables inclusion of maximum information on one sheet only, without the need to turn pages. This type of fold is available by custom quote only. 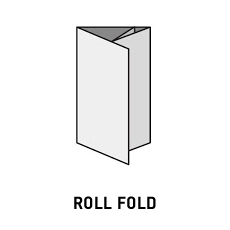 ROLL FOLD: This fold is achieved by folding the sheet of paper inwards from the right and folding the leftmost panel over the rest of the sections. 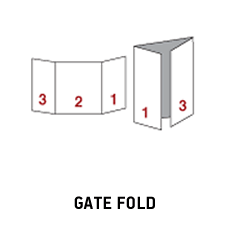 This fold is applicable to brochures with four or more panels. Request an estimate for this type of fold. For any other custom folds, please do not hesitate to let us know. Our creative design team will help you with your brochure design needs. We always go an extra mile when performing design projects for our customers to make sure that they receive the best possible service. If you wish to express your own creativity, the brochure online design tool will be available soon. One of the most important aspects of a brochure are the images. Our file pre-flight team will carefully review your files before they proceed into production. They will check image quality and convert colours to CMYK if required. If they spot any issues with your provided or designed file they will send you an online proof for approval. Please note: our file pre-flight team will not check spelling or grammar in your files. Everyday more and more people choose online printing services as they are more convenient, have instant pricing and ability to place an order within minutes. As for PrintSale.ca, we are not only offering all those features but also an interactive file uploading tool, which will check your file for any issues instantly and will show you a 3D folding proof of your brochure, to make sure that your panels are in the correct spots. Our interactive uploading tool accepts PDF, PNG, JPG and TIFF formats. If you have a huge PDF file, you can also send us a link to that file on your Google Drive or any other online storage solutions for our pre-flight team to download and process the files. PrintSale.ca prides itself for being the most reliable and cheap printing Toronto provider. Committed to saving the environment, we use eco-friendly toners for our state or art digital presses and by recycling toner bottles. By having a well optimized integrated online system, we are able to deliver a high quality brochures to our customers in Toronto at a discounted rate and fast turnaround times. For file specifications and instructions on how to use the templates, please download "Template Instructions.pdf" for the specific size of your printed product.